Choosing the best puppy food can be a very confusing matter. There are so many different manufacturers competing for your valuable custom, with so many ingenious marketing strategies. To find the best food to feed your puppy you must look beyond the cute puppy photographs and the cleverly designed packaging. It is true that a growing puppy has a greater energy requirement than a fully grown dog (puppies grow 20 times faster than adults) but care must be taken to ensure that energy-rich dietary fat is carefully regulated. This will help to avoid the possibility of skeletal disorders in some breeds and long lasting canine obesity in others. AAFCO is the body that regulates commercial dog foods and they set out clear nutritional guidelines for which all dog food brands must meet. We have researched and selected foods based on AAFCO's nutrient profile criteria for dogs in the growth and reproduction stage. They recommend formulas to have a minimum crude concentration of dry matter protein of 22.5% and crude fat of 8.5%. If this is your first puppy and you're not sure what brands you can trust we have put together a list of the top rated puppy food brands that meets the recommended criteria for growing puppies which is: HIGH-PROTEIN, HIGH-FAT and LIMITED CARBS. Although you may think all dog food manufacturers have your dog's best interests in mind, this is not always the case. Unfortunately, many health related problems in dogs can stem from a lack of proper nutrition when they were a puppy. Each of the following puppy food brands are especially formulated to provide you with a good nutritional foundation all puppies of all breeds and sizes need. We have thoroughly researched their ingredients, recall history, customer feedback, all in an effort to ensure that your precious puppy is on the very best puppy food brand. If you are a pet owner of a larger breed or a smaller breed size ﻿puppy﻿, we have separately researched specially formulated dog foods since there are specific guidelines to follow in order to know ensure your puppy receives the best nutrition. See our top rated puppy food for a large breed and small breed size dog further below. Orijen imitates a dog’s native diet and provides a balanced and nutritious formula of meats, vegetables and fruits. Containing up to 85% meat, it includes organic chicken and turkey, fresh wild-caught fish, chicken liver, eggs and 15% vitamin and mineral rich fruits and vegetables. It is 100% grain-free and probiotics and prebiotics are also included to help your pup’s digestion. First 5 ingredients: deboned chicken, deboned turkey, yellowtail flounder, whole eggs, whole atlantic mackerel. 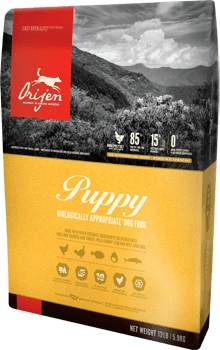 Proteins of 43%, fat 23% and 25% carbs makes Orijen the best puppy food because it meets the criteria of high-protein, high-fat and low carbs diet for a growing puppy. Granted this is also more expensive than most other brands, but we can see why. Orijen makes nutritious and quality dog food with chicken "fit for human consumption", have stellar ratings and no recall history. Wellness offers a range of puppy food formulas in various flavors. 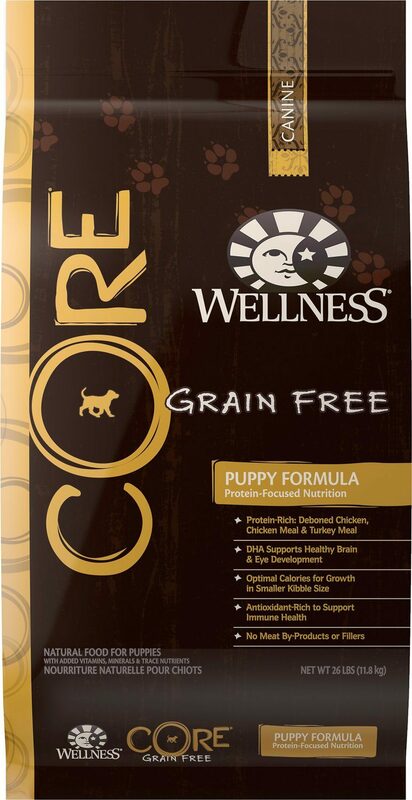 As your puppy requires high amounts of protein and fats but lower carbs, we have selected Wellness Core Grain-Free Puppy from all its puppy-based formulas meeting this criteria. Coming second, another high-protein formula made from chicken (deboned & meal), turkey meal (natural source of vit. B6 and 12, selenium, protein, selenium, and zinc), salmon oil (a natural source of vit. E, omega 3 fatty acids, DHA and EPA), peas (contains as much as twice the protein of most vegetables), potatoes, fruit and veg. First 5 ingredients: deboned chicken, chicken meal, turkey meal, potatoes, peas. You won’t see any by-products, corn or soya, wheat or colors, artificial preservatives or flavors in this formula. Packed also with antioxidants, probiotics, flaxseed, vitamins and minerals. High-protein, high-fat but limited carbs and low in calories (417 kcal/cup) makes this a very close contender to Orijen. No wonder, Wellness is amongst the best puppy food options based on quality and affordability, having many quality ingredients used throughout with a good amount of meat. Blue Buffalo claim to use only the best natural ingredients for its holistic dog foods. The goal is to provide all dogs of all ages with a food that incorporates all the same nutrition and supplements that we humans eat. 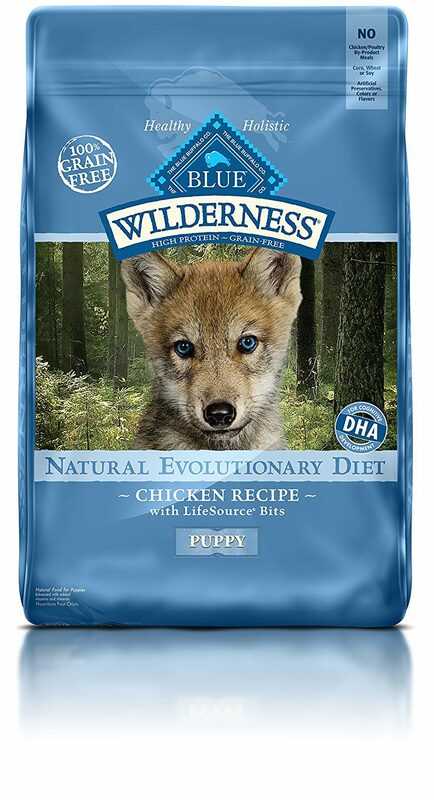 We have selected to review Blue Wilderness Chicken Recipe for Puppies as this formula meets the recommended criteria for which pet owners can feed their puppies with. Blue Wilderness Puppy Chicken is a grain-free high-protein formula derived from nutritious ingredients such as real chicken, chicken meal, turkey and whole eggs. This formula also contains vitamins, minerals and antioxidants to help support a balanced cellular health and DHA for cognitive development in your puppy. First 5 ingredients: deboned chicken, chicken meal, tapioca starch, peas, turkey Meal. This protein-rich, high-fat, low-carb and low calorie diet (only 418 kcal/cup) will ensure your pup will grow healthy and strong during its most important months of their lives. Victor is a US dog food manufacturer with many of their formulas receiving 4 and 5 star ratings on the Dog Food Advisor site. Their formulas are nutrition-dense and at a fair price for such a premium food brand. 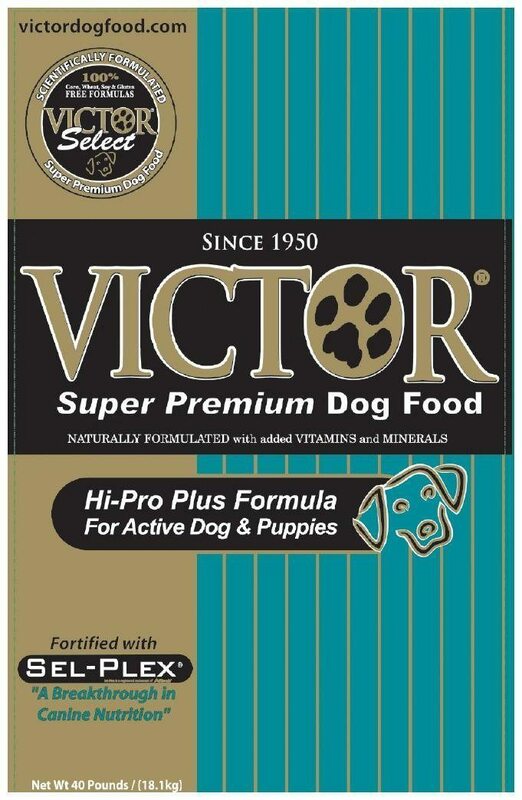 We have selected Victor Dog Food Select Hi-Pro Plus Formula for Active Dogs & Puppies, a specially formulated puppy formula and five star rated product which is a great option for providing the required nutritional value your puppy needs. This nutrient-rich, multi-meat and gluten-free product is a great formula for puppies. In fact 83% protein is derived from meat, poultry and fish sources, 7% from plant and vegetables and 10% from wholegrain sources. First 5 ingredients: Beef Meal, Grain Sorghum, Chicken Meal, Chicken Fat and Pork Meal. Packed at only 450 kcal/cup, this meaty based formula is especially designed for growth and development containing the right proportion of protein (est. 33%), fats (est. 22%) and carbs (est. 36%), along with minerals and vitamins. We also like the fact that all meat is US sourced! Scientific studies show that nutrition plays a vital role for large breed puppy. It is recommended that slowing down growth, not restricting protein as it more commonly believed, is the key dietary factor to decrease the risk of your puppy developing joint and arthritic problems later on down the road such canine hip dysplasia, ostechondrosis and other orthopaedic problems common in large breed dogs. It has also been shown that excessive dietary calcium in large breed puppies is linked to the increase of skeletal disease In light of this, we follow the recommended criteria of: LOW CALORIES, LIMITED CALCIUM and LOW FATS. Here is a great video of a veterinarian I think offers valuable advise on discussing proper nutrition for a large breed puppy, you can skip to c. 3:30 mins video where she begins to discuss nutrition. 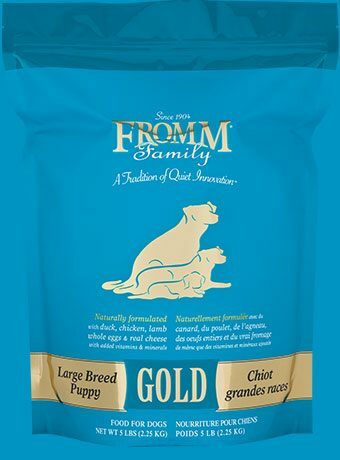 We have researched a significant number of large breed specially formulated foods and we have selected FROMM Gold Nutritionals Large Breed Puppies is the top rated large breed puppy food based on the min. required criteria. The first and oldest premium dog food company the Fromm Family have earned the reputation as a dog manufacturer leader with many of its dog food formulas receiving between 4 and 5 star ratings on Dog Food Advisor site. Based in Wisconsin, Fromm Family Foods is now in its fourth generation of being family owned and operated. They claim their foods are prepared with fresh, human grade USDA-inspected meat and fish and use only 100% natural and wholesome ingredients with no artificial flavors, colors, hormones, corn or wheat. We have selected Fromm Gold Nutritionals Large Breed Puppy Gold due to its high-meat content and found it adhered to the recommended criteria of low fats, adequate protein, low calories and correct calcium-to-phosphorus (Ca:P) ratio of 1:1 to 1.8:1. This formula's ratio of Ca: P is 1.1 : 1 and has calcium of 2.7 g per 1000 kcal. This formula's first three ingredients are meat products and also combines the healthy benefits of salmon oil with an unmatched combination of fresh produce, including carrots, lettuce & celery to create a truly spectacular dish. In addition, it includes a combination of probiotics and prebiotics to enhance the growth of beneficial bacteria, and inhibit the growth of harmful bacteria such as E. coli and salmonella. This grain-free product does not contain corn, soy or wheat which are common potential allergens and is free from meat by-products. Instead, specialty grains like barley, rice, and oats are used as the carbohydrate source and we particularly like the addition of whole eggs. This formula provides complete and balanced nutrition for all life stages as established by the AAFCO Dog Food Nutrient Profiles. First 5 ingredients: duck, chicken meal, chicken, oatmeal, pearled barley. The perfectly balanced ratio of Ca:P of 1.1: 1 will also help lower your pup's risk of hip dysplasia or other serious bone and joint disease later on in life. In contrast to large-breed puppies, small ﻿﻿and﻿﻿ toy breed ﻿﻿puppies will require a higher energy requirement (over 400kcal /cup), denser proteins, a higher digestibility and a smaller sized kibble. In addition, formulated foods for small breeds do not control calcium levels. We have researched a number of small breed specially formulated foods and we have selected Merrick as the best small breed puppy food brand based on the recommended criteria. The mission at Merrick, a US based manufacturer, is "Comfort for the Soul" and they do so by offering simple, nutritious and healthy products. Merrick products give you comfort to know that you are giving your pet a healthy meal. The secret to Merrick dog food is the simplistic approach they take in making their foods. They use the least amount of steps as possible during their manufacturing process of Merrick dog foods and uses only the highest quality ingredients sourced locally in America. They stay away from using any artificial colors, flavors or preservatives in their formulas. Their grain-free formulas have high-meat percentages and receive Advisor’s top rating of 5 stars and is no wonder since their manufacturing process helps retain many of the natural benefits from the high-quality ingredients they use. 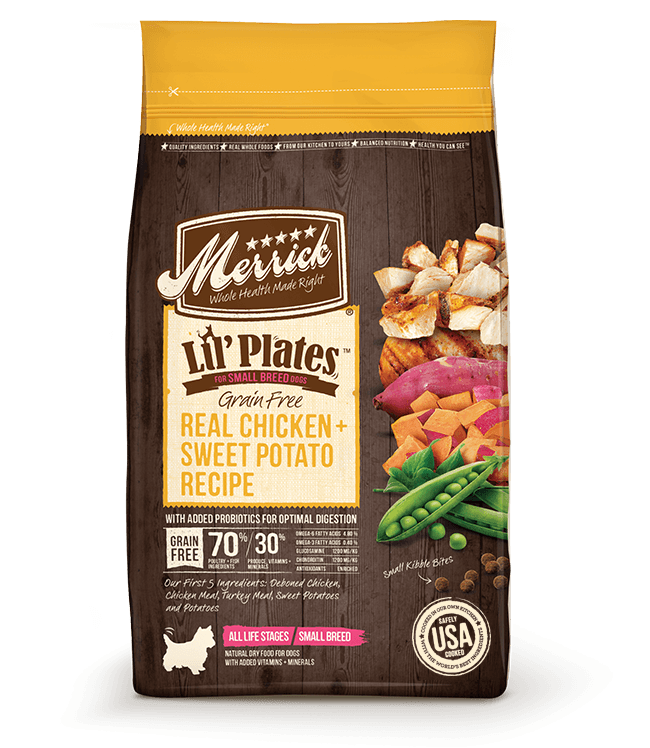 We have selected Merrick Lil Plates Real Chicken & Sweet Potatoes for Small Breed Puppies formula since it met the required criteria of higher calorie levels to support their higher metabolic rates as well protein-dense and adequate fat levels whilst still maintaining optimum carbohydrate levels. High protein, healthy fats and limited carbs is the optimum nutrition diet for a growing little pup. This formula uses deboned chicken sourced locally in America as its primary ingredient, is packed with amino acids for developing healthy muscles and metabolism and is further enhanced with vitamins and minerals in particular chondroitin and glucosamine which is so vital to a growing dog. First 5 ingredients: deboned chicken, chicken meal, turkey meal, sweet potatoes, potatoes. This food comes highly recommended by other small breed owners citing small bite kibble size, nutrition-dense and quality ingredients with no fillers or any other unwanted additives. Suitable also for pups with sensitive stomachs, this formula ticks a lot of the boxes which is why we rank it as the best small breed puppy food. Protein is generally considered to be the most important part of a growing puppy’s diet and as owners looking for the best dog food for puppies we should always remember this. Lack of protein during the growing stage has been shown to be potentially harmful. AAFCO recommends protein-consistency foods for growing puppies should have min. of 22.5% crude protein on a dry matter basis (i.e. when adjusted for water). Protein is needed in larger amounts by growing puppies than it is by the adult dog, due to the rapid growth of the puppy’s muscles, joints and bones. The energy requirements for a puppy are considerably higher also making it essential for them to receive food nutritionally rich and calorie dense. Many manufacturers bulk out their food with cheap and easy to source protein from vegetables and grains rather than using the ideal source which is animal protein. This results in much greater profits for the producers and not the best puppy food for your growing puppy. Always check the ingredients of your puppy food to see if the product contains more vegetable protein than animal –usually you can tell if two or more grains are listed in the first five ingredients. Attempt to steer clear of food produced from low quality by-products such as intestines, chicken feet, heads and so on. You wouldn’t eat them so why give them to your pet? Often puppies find such food very difficult to digest – result being poor nutrition and the potential for lots of mess for you to clear up! Look for foods rich in chicken meal – an excellent source of protein as the water has been removed. Fish is also an interesting choice – catfish for example is often used and provides a good source or protein as well as being rich in essential oils and low in saturated fats. Your puppy is a carnivore – a meat eater with no desire to become a vegetarian! Your new canine friend was designed to eat animal protein and may well find some vegetable alternatives difficult to digest. Occasionally dogs may even become allergic to them. With this in mind you need to consider a high quality commercial brand, a raw meat diet or making your own food as home as part of your normal cooking regime. As this is the time when your puppy’s immune system is developing, it is important that the puppy receives adequate amounts of omega fatty acids. Omega fatty acids help develop a healthy immune system as well as keeping the skin and the coat healthy. Another nutrient that is important for the development of a healthy skin and coat is protein. And of course good nutrition must include the correct balance of vitamins (D), minerals (phosphorus/calcium) and antioxidants as these are all necessary for the healthy development of the bones and teeth and need to be present in the puppy’s diet in the proper amounts. Some owners choose to add supplements to their puppy’s food but as with humans, if the diet is healthy and well balanced, supplements should not really be needed. Some very high quality feeds will include other health giving ingredients such as bacterial cultures, certain vegetables and plant fiber which may be beneficial to your puppy. What Foods To Feed Your Puppy? The topic of the "best puppy food" is so controversial – so many opinions. There really is no definitive answer to the question. The market is full of competing brands all claiming to be the best, the most healthy and the best value money. What is certain is that there are two possible choices when considering the best food for puppies. Most owners opt for a commercial puppy food option – I know that I do although I sometimes supplement it with food made at home. Why? Because there is a lot of choice, it is certainly convenient, easy to obtain, less time consuming and usually very cost effective. There are some really excellent commercial puppy food brands available and for many people the best dog food for their pup will be a commercial brand. But of course commercial foods is very big business and there are many different companies competing for your custom. With this in mind it is very important that you have a good understanding of the labeling used with regard to puppy foods and utilizing well-researched nutritional findings specific to certain breeds and breed sizes all of which will be dealt with in detail further below. There are some truly dreadful dog food brands out there with awful ingredients and no nutritional value but it is possible to distinguish the good from the bad and the ugly. There are two different approaches to raw feeding a puppy. The BARF (Biologically Appropriate Raw Food) diet which is made up of raw, meat, bones and vegetables or the RMB (Raw Meaty Bones) diet. Splintered bones could penetrate the digestive tract. Puppies could catch parasites from raw meat. Bones may cause chocking and broken teeth. Difficult to provide a balanced diet of vitamins, minerals, fiber, carbs, protein & fats. Pet nutritionists advocate that preparing homemade dog food isn’t entirely a bad idea for pet owners. Nevertheless, it should be done under the supervision of experts. The decision as to which feeding method best suits you and your puppy depends on a number of factors including convenience, cost, and your perception as to what is acceptable or desirable for your pet. What Makes a Quality Puppy Food Brand? Start here! Learn to read the label. We have already discussed that protein is the most important part of your growing puppy’s diet. So do the ingredients list a clearly named meat or meat meal in the first position on the label? If not then consider why not! The best food for your puppy should have meat in it! Does the label refer to the word DIGEST? Now this is rather like a soup produced from any number of animal parts retrieved from a variety of different sources. Almost unbelievably this may include animal products from diseased animals, animals which have been put down by vets, road kill as well as the leftovers from stores and restaurants. These animal parts are broken down in a chemical process and the resulting ’soup’ is used by some manufacturers as an ingredient in their foods. There is even anecdotal evidence that some of the animals used in this grisly process may still be wearing collars and even still encased in plastic bags when they are entered into the system. The unpleasant possibilities here would appear to be endless! It would appear obvious that the best rated puppy food will not contain such an ingredient. Many manufacturers list by products as forming part of their recipes. By products are essentially leftovers from the animal processing system. The production of food for humans produces waste material which is considered unfit for human consumption. These materials, however, may be used quite legitimately in the production of puppy and dog food. Look out for those by products where the species origin is not stated – if the label states ‘poultry by products’ for example then you might immediately assume chicken. The definition of poultry used here however, is far wider and may include road kill or birds which have been put down. Do you want to run the risk of feeding somebody’s dead parrot to your dog? When it comes to the fat used in dog food chicken fat is best. Look out for descriptors such as ‘animal fat’ on the label. ‘Which animal?’ is the question which should spring to mind. Some manufacturers use the by products of the grain milling process as part of their feeds. Materials such as rice mill by products or wheat middlings have little if any nutritional value and are commonly referred to in the industry as ‘floor sweepings’! Such practice may be good for the milling industry but surely it cannot be good for your dog. The best puppy commercial food will not contain these ingredients. Does the label list ground corn high on the ingredient list? Corn may appear harmless enough but it is clearly not a natural part of a dog’s diet so you have to consider why some manufacturers use it. If corn products are being used as a main ingredient in the feed you are using the manufacturer may be attempting to increase the amount of crude protein material listed on the label. The protein found in corn is actually very difficult for your dog to digest and tends to pass through their systems and emerge as waste. Corn is used as a filler and is a cheap food source that many dogs are allergic to. Other fillers to look out for include brewer’s rice, feeding oat meal, corn gluten, wheat gluten, and soy. Once again these materials are not easily broken down and tend to pass through the system almost completely undigested. Some of these products are often cited as being possible causes of food intolerance and even food allergy in dogs. Look out for wheat hulls, corn bran, and cellulose. These are completely indigestible fiber and serve no purpose other than to bulk out the food and make the dog feel full more quickly. You should not find these in the best brand of puppy food. Look out for artificial preservatives. Although some form of preservative will always be needed for commercial brands, these artificial materials are a cause for concern. Although they are used in small amounts there is considerable evidence that they can accumulate, over a period of time, in your dog’s body and many have been linked as possible contributing factors towards the development of a number of serious conditions including cancer. In addition treat artificial dyes or colorings as a possible cause for concern – why do they need to be included? Consider why some manufacturers include sweeteners in their feeds. Besides being full of calories, they can contribute to tooth decay and serve no nutritional values. Look for the word menadione as part of the labeling. The evidence is still out on this one but there is certainly considerable cause for concern. If you are feeding your dog a complete, well balanced diet, there is no need to add supplemental vitamin K. Is it really necessary to risk your dog’s health while the scientists do their research? Watch out for artificial anti-oxidants, anti-caking agents and emulsifiers. 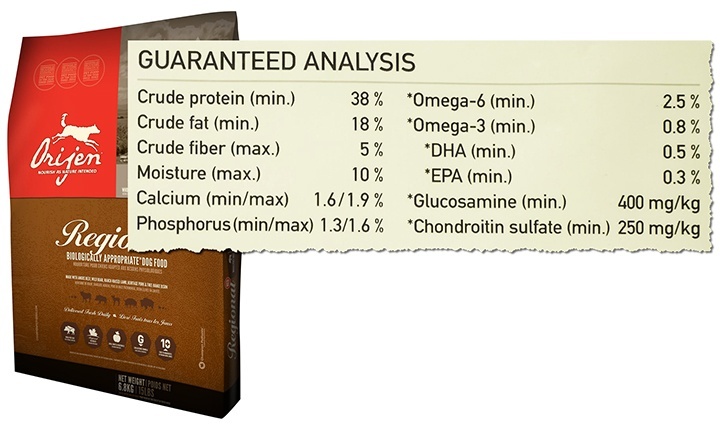 The guaranteed analysis label is important when compared against the ingredients list as this will tell you very quickly whether the ingredients inside are just marketing gimmicks for dog owners who don't know any better or the real deal. Converting proteins, carbs and fats to dry matter means we adjust percentages for water and these figures are more meaningful to you when comparing food brands. Look out for the following when identifying “the best food for puppies” from a commercial manufacturer. It’s a long list but it’s worth the effort to give your pet the best puppy food available. Does the label list named fresh meats and named dry meats before the first listed fat? Always look for a good source of protein listed in the first 5 ingredients. The two best sources of protein are chicken meal and catfish. 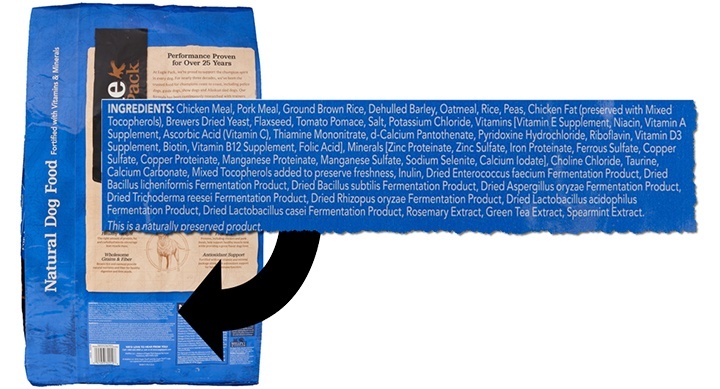 Does the formula have an average of 26% of high-quality protein including chicken meal? Chicken meal is preferred because it is a more concentrated source of protein, as most of the water has been removed. Does the formula use human-grade meat and grain sources. This means USDA Grade A meats and USDA Grade 1 grains. Are the animal sources certified as organic? Does the formulation include whole ground grains such as oats, rice, barley and so on? Are they certified organic? Does the formulation contain starches and legumes that are certified organic and are pesticide-free? Does the food contain at least 2.2% Omega 6? Does the food contain Omega 3? Is there at least 5 x as much Omega 6 as Omega 3? Does the formulation use organic preservatives such as mixed tocopherols, ascorbic acid, vitamin C, and so on? Only organic preservatives will be used in the best puppy food. Does the food contain non-acidic, time released Vitamin C, vitamin E and K? Does the food contain therapeutic levels of ​glucosamine and chondroitin appropriate for your dog? Does the dog food contain probiotics and prebiotics? Is the brand of food free of chemical preservatives like "Ethoxyquin," "BHA," "BHT," and "propylene glycol. For the best puppy food the answer should be yes – to as many as these questions as possible. With the constant flow of dog food recalls it's important more than ever to know how to read your dog's food label, know where your dog food is being manufactured and where they are getting their ingredients from. Puppies burn a lot of calories! If you are feeding kibble, the manufacturer will have suggested guidelines about the recommended daily quality required. As a guide, there is roughly 400 calories in a cup of dry dog food. Always make sure that your puppy has plenty of fresh water available and don’t allow bowls of uneaten food to lie around – if it hasn’t been eaten after 20-30 minutes throw it away. This may appear wasteful but rather that than a sick puppy. You should feed your new puppy four times a day until he is four months old. This can then be reduced to three times a day until six months when just two feeds should be provided. Your dog should be fed twice a day from then on. It has been shown scientifically that feeding your dog a healthy diet of high quality food can add up to five years to his life. Existing owners are only too familiar with how vital a healthy and nutritious diet is to a dog’s life and overall health. There is an overwhelming amount of dog foods to choose from and finding the best dog food for puppies can be quite a daunting and exhausting task. Owners can help improve the longevity of their dog’s healthy lifestyle by researching nutrition for their particular dog breed and size. Small and medium breed puppies should be fed a diet of high calories, high protein, healthy fats and limited cabs to support their higher metabolic rates. Large and giant breed puppies require moderate calories intake and low calcium levels during the growth stage in order to achieve a slow and steady growth to stop the risk of developmental orthopedic diseases later on in life. Thank you for reading and we hope you have found the information useful. What are your own experiences and tips for feeding your puppy? Share your tips below and please don’t forget to share with us if you found this content useful!